The Bill & Melinda Gates Foundation has announced a $400 000 grant to the University of KwaZulu-Natal’s Pollution Research Group (PRG) to fund an innovative and groundbreaking initiative that will take toilet technology and sanitation to a new level. UKZN’s Pollution Research Group, led by international expert and academic Professor Chris Buckley, will explore the design and implementation of an innovative toilet system that will lead to the safe disposal and recovery of valuable material from excreta from community ablution blocks. The PRG’s project, which will partner with local companies, will be based on actual ablution blocks serving informal communities in eThekwini (Durban). This area is home to approximately one million people, the vast majority of whom are unemployed and do not have access to acceptable sanitation facilities. The situation is exacerbated by an influx of poor people at a rate of 10 percent per annum. Currently utilized urine-diversion toilets will be modified and developed to include three streams of waste (urine, feces and wash water). The solid waste and bulk objects (e.g. toilet paper and diapers) will be processed to ultimately produce ash for fertilizer, flue gases and steam for water recovery, and energy for heating the drier and combustor which are integral to the process. The urine and flush water will be filtered and transferred to a water-recovery unit where a high-quality water stream will be removed and sent to a general water-storage tank. The remaining concentrated urine stream will then be processed in order to separate the urea and other salts. It will, however, require deodorizing and would need a microbial risk analysis in case any of the separation processes fail, resulting in water-borne disease. It is envisaged that this water will be used for flush purposes, system cleaning and hand-washing, once chlorinated. Professor Chris Buckley, a Chemical Engineer, has conducted contract research into urban and industrial water management since 1970. The research by the PRG is grounded in the realities of service delivery to unserved communities and it has provided extensive scientific support to the water and sanitation division of the eThekwini Municipality, located in KwaZulu-Natal. The group’s team of researchers more than adequately fit the Challenge’s specifications. According to Buckley, the competitive advantage of the PRG project is three-fold: “firstly it draws together a team of researchers who have expertise in each of the different areas of chemical process engineering; secondly, it will build upon local experiences in the provision of sanitation services to the poor and thirdly, it has, as its main focus, the gathering and generation of previously scarce or unavailable data that is essential to the successful design of a chemical and physical excrement processing facility.” Regardless of the outcome of the project, the data generated will be extremely valuable as it will be immediately applicable for any subsequent design. The PRG will rely on input from its local partners for many important aspects of the project which will play a key role in its ultimate success: eThekwini Water and Sanitation will provide logistical support and access to community ablution blocks; the Water Research Commission of South Africa will come to the party with information from associated projects; Hering South Africa will bring their ablution block design experience; Partners in Development will offer engineering support; Envirosan will be responsible for the toilet pedestal development; and Energy Engineering International will contribute towards the thermal engineering aspect. Ten UKZN academic staff, possessing a wealth of chemical engineering expertise, will also be involved in the project which will be managed by a research fellow. Undergraduate chemical engineering students will participate either through student projects or as general assistants. In addition, “the extensive experience of the local eThekwini Municipality in the management of community ablution blocks will inform the design and economic feasibility of the system,” said Buckley. This news is from the Bill & Melinda Gates Foundation, 19 July 2011. Water and Sanitation Related Diseases and the Environment: Challenges, Interventions and Preventive Measures, Published in Collaboration between Wiley-Blackwell and Horizon International, will be released in August 2011. 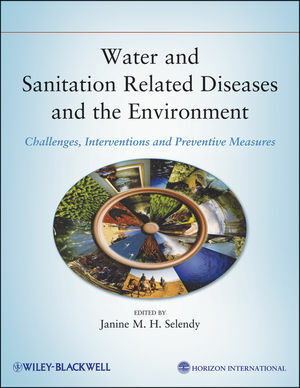 Written by experts from the fields of public health, medicine, epidemiology, environmental health, climate change, environmental engineering, and population research, this authoritative volume provides a thorough understanding of the interconnection among many factors linked to water related diseases, sanitation, and hygiene.